Costume included detailed coat, silk blend shirt, silk sash and stretch pants. This costume was inspired by the one worn by Angelica in Pirates of the Caribbean: On Stranger Tides. 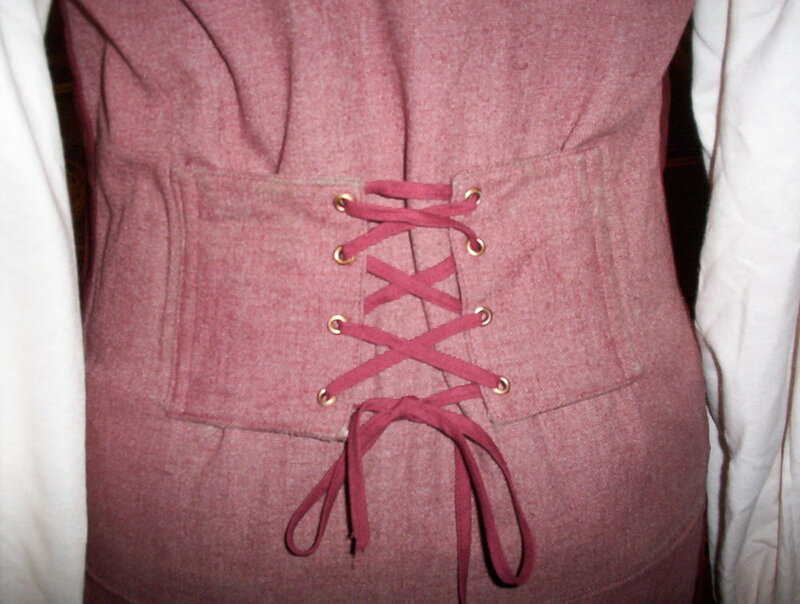 Costume includes pirate coat, blouse, pants, vest and corset. All fabrics are high quality and detailed. Costume is simply inspired the original one worn in the movie. Some elements have been altered for cosplay. more details of the costume can be seen below. I used some vegan leather for the corset and historical style trim for the coat. Some more photos of the cosplay costume look can be seen below. The coat fabric is an amazing texture. Perfect for pirate adventures. This coat was loosely inspired by Hook from Once Upon A Time. Details were changed to create a more feminine silhouette. The cosplay style coat I created can be seen here below. This coat is fully lined in a black swirled design fabric and accented with silver metal buttons. Back laces up for a custom fit. Hem is high low. Longer in the back and shorter in the front. High collar can be worn folded up or down for your desired look. Coat does not close. It is designed to feature a gap in the front. Two pockets are inside the coat. Perfect for stashing pirate treasure or daily accessories. Coat fabrics are a poly stretch suiting in a deep rich black collar. Lining is also a poly blend fabric. Silver metal buttons are used for decorative accents. 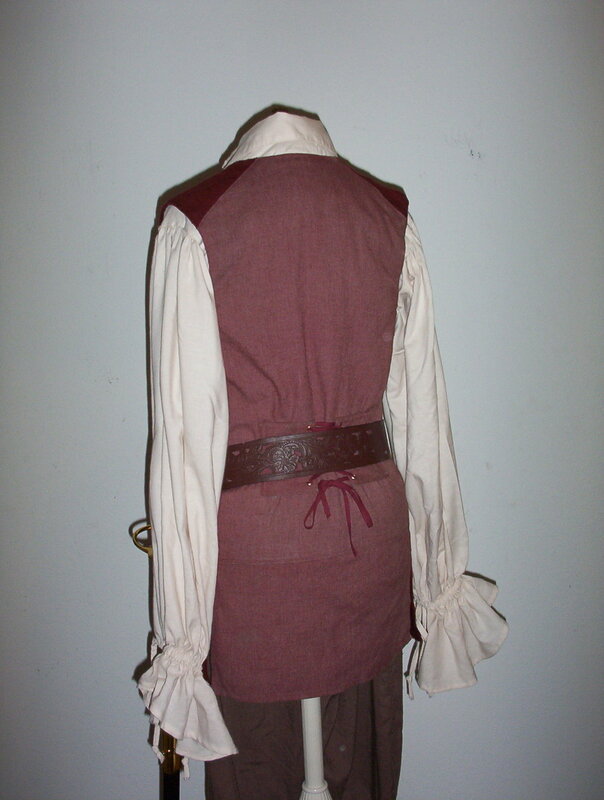 The following costume is one I created for myself to wear to events and pirate movie opening nights. The costume was something I designed from original ideas and historical inspiration. The costume includes a corset, linen under dress, brown skirt, sash and brown leather jacket. I also recreated this costume for a customer who wanted something similar, but with a few additions of color and design elements. That costume be seen here below. Costume includes corset, skirt, under dress, jacket and sash. The following costume is one I created for a customer who wanted a costume in the style of my own pirate costume. The costume was something I designed from original ideas and historical inspiration. The costume includes a corset, linen under dress, brown skirt, sash and brown leather jacket. Sash in 100% silk and rustic linens are used throughout the costume look. more photos of my costume can be seen below. This costume was inspired by the one worn by Elizabeth Swann in Pirates of the Caribbean: At World's End. This costume includes detailed coat, belt, bracers and pants. Embroidery was hand sewn on the sleeves and the rest of the costume was detailed out with ornate trim. I have done many versions of this Pirate King Inspired costume, but this is a more causal classic look. All high quality fabrics and linen fabrics were used. The following photos show the details and color of the costume I created for a customer looking to cosplay Elizabeth Swann from POTC3. more details of the costume can be seen below. I used some lovely vintage lace and buttons to finish off the look. Some more photos of the cosplay costume look can be seen below. The black linen fabric is an amazing rough texture. Perfect for pirate adventures. The following costumes were inspired by Elizabeth Swann's Pirate King Costume in Pirates of the Caribbean: At World's End. Each costume is slightly unique depending on the look the customer wanted to achieve. Not all details are indentical the movie as it is simply meant to be inspied by the orginal costume. I have created multiple versions of these costumes over the years. Here are a few of my favorite looks based of the original Pirate King Costume worn by Elizabeth Swann. The costume above featured vegan leather armour accents at neckline and cuffs. The following costumes were inspired by the one Elizabeth Swann worn in Pirates of the Caribbean: Dead Man's Chest. Some of the costumes feature a brighter color pallet depending on what each customer wanted. The costume are simply meant to be inspired by the original costume worn in the movie. 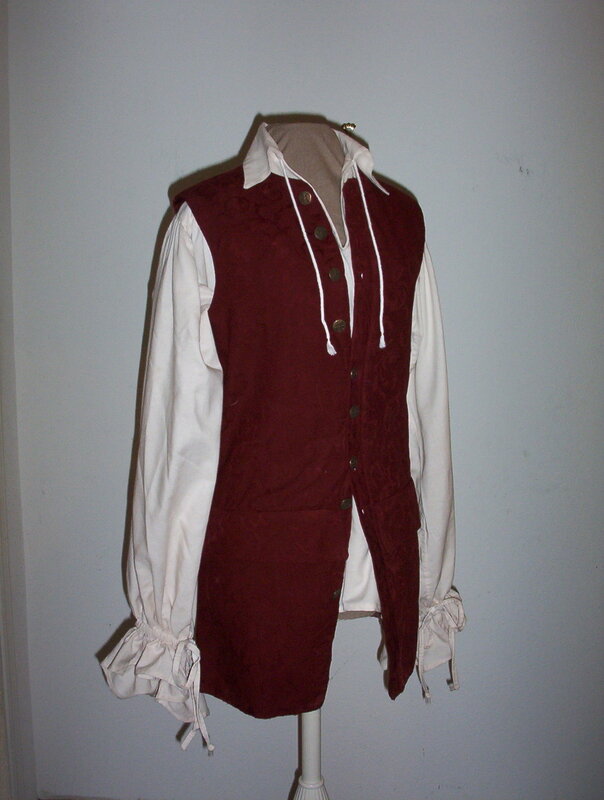 The costume sets included a pirate shirt, pants and vest. The following coat is one I created for a customer who wanted something in a flattering style, but a classic pirate look. Here is the design we came up with. The fabric is a lovely vegan suede and is accented with metal buttons. 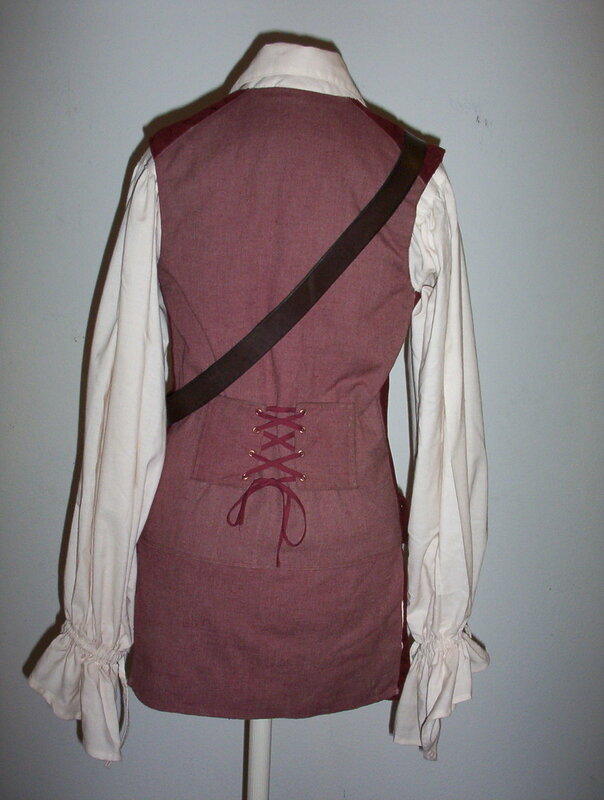 The following is a selection of custom shirt orders and other pirate costume sets for females. Each garment was uniquely made for the customer depending on the look they wanted to achieve. Disneyland Inspired costume below and to the left.